A ring laser is a laser the resonator of which has the form of a ring. In contrast to a standing-wave laser resonator, such a ring resonator allows for two different propagation directions of the intracavity light. In many cases, unidirectional operation (where light propagates only in one of the two possible directions) is enforced by introducing an element into the resonator which leads to different losses for the propagation directions (Figure 1); this can be, e.g., a Faraday rotator combined with a polarizing element (e.g. a Brewster surface of the laser crystal). 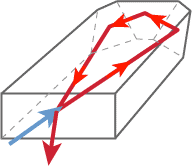 If unidirectional operation is achieved, there is no standing-wave interference pattern in the laser gain medium (except near reflection points), and consequently no spatial hole burning. Therefore, single-frequency operation is easily achieved. Particularly for solid-state bulk lasers, unidirectional ring laser designs can be considered as a standard approach to obtain stable single-frequency emission. 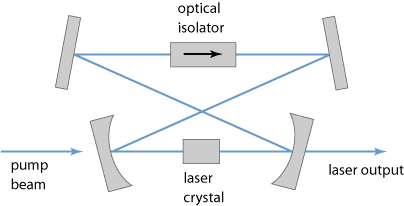 Figure 1: A ring laser resonator, where unidirectional operation is enforced with an optical isolator. Figure 2: Photograph of the VERDI green laser from Coherent. A unidirectional ring laser resonator is used, enabling low-noise single-frequency operation. The image was kindly provided by Coherent. 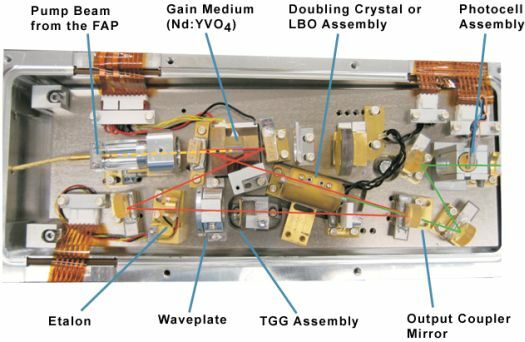 Figure 3: Setup of a monolithic ring laser (NPRO or MISER). See the article on nonplanar ring oscillators for more details. A popular kind of solid-state ring laser is the nonplanar ring oscillator, also called NPRO or MISER. This is a monolithic laser design (Figure 3), where the whole laser resonator consists only of a coated crystal. Although the fabrication of such crystals is somewhat more complicated than for ordinary laser crystals, alignment is fairly easy, and such lasers are very stable and robust. There are also fiber lasers with ring resonator configurations. Fiber ring lasers are more often mode-locked lasers than single-frequency lasers. A frequently used configuration is that of the figure-of-eight laser , containing a nonlinear loop mirror as effective saturable absorber. The ring geometry then does not serve to avoid spatial hole burning, but rather follows from the principle of the artificial saturable absorber (a nonlinear loop mirror) as required for pulse shaping. There are other ring lasers, used e.g. in optical gyroscopes, where bidirectional operation is required. Outside the laser resonator, a beat note of the beams corresponding to the different propagation directions can be detected, and the beat frequency reveals the angular frequency of rotation of the laser (Sagnac effect). Special care is often required in order to avoid coherent locking of the counterpropagating waves. In particular, it is necessary to avoid even very weak parasitic reflections (e.g. on imperfect laser mirrors) which can couple the counterpropagating modes.